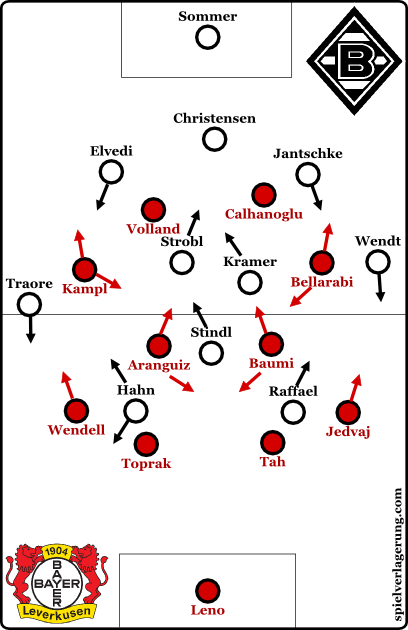 From a tactical perspective perhaps the single most interesting aspects of Leverkusen’s, and indeed any Schmidt team, game is their pressing movements. Furthermore the the way Schmidt adapts the schemes from game to game as well as the modifications over longer periods for strategic shifts are fascinating. Starting from a base 4-2-2-2 shape Leverkusen prioritise control of the centre. This is mainly achieved through the compactness they possess in these areas. The shape thus begins in a very narrow fashion with the two forwards in the centre aiming to block passes into midfield. The two “wingers” behind are stationed in the half spaces which gives them the ability to support and establish access both in the centre and on the flanks. The midfield two behind support the press by maintaining good distances to the pressing layers ahead. This positioning is enough to force most opponents into playing on the flanks and despite the narrow starting shape Leverkusen retain the access to press on the flanks through quick ball-oriented shifting. In these areas Leverkusen press aggressively with a highly compact shape and strong use of the ball-near full-back for even better access on the flanks. Whilst this is the base pressing scheme and the general scheme is rarely ever compromised, the specific roles of the players in certain phases of the press are adapted and modified from time to time. In this game they were up against a Gladbach side who operated who operated in a 3-4-1-2. The back 3 in addition to the wing-backs immediately poses a different question to Leverkusen’s pressing scheme. The natural overload in the first line in addition to the wing-backs could theoretically give Gladbach the ability to practice a stable wing-oriented build-up. The Leverkusen press, therefore, was constructed to reduce this possibility although they were not always consistent. While the starting shape was very similar, the movements of the ball-far players were interesting. The ball-far “winger” would at times stay high which, in addition to the ball-near one pressing, created situational 4-2-4 pressing structures. This was presumably an attempt to retain access to the horizontal switches Gladbach use across their back line. By maintaining a high presence in their first pressing line, Leverkusen could neutralise Gladbach’s overload in the first line and create access quicker. This could in turn force Gladbach into quicker progressions and passes into areas where Leverkusen could press aggressively and collapse on the ball with the players who were higher and wider in the earlier phase. Once they did manage to force the ball wide, the ball-far winger would often then drop into the midfield along side the ball-far central midfielder. The staggering of the midfield pair was also significant, whilst the ball-near midfielder would step up, often marking Gladbach’s 6, the ball-far one would shift across and hold a deeper position. This further supported their ability to congest the ball-near areas and retain control of the centre with this layered pressing scheme. This often created a 4-1-3-2 or asymmetric 4-2-2-2 depending on the ball-far wingers’ movement. Faced with Leverkusen’s pressing structures Gladbach were quite patient in their build-up. The use of Sommer was crucial, by retaining the ability to pass back to their goalkeeper, Gladbach could avoid the traps Leverkusen tried to set on the flanks. This route of restarting their build-up was also needed in the situations where Leverkusen’s ball-far wide player remained high to prevent circulation across the back 3. With the compactness of their opponents in the centre, playing through the midfielders was not a consistently viable strategy so Gladbach looked to practice a wing-oriented build-up. To make this effective Gladbach would need to find a way to stabilise possession in these areas. This is not only due to the natural instability of the location but also their opponents’ tendencies to trap opponents there. In order to stabilise their wing-oriented construction Gladbach used some interesting methods, mainly revolving around ball-near overloads and combinations. When one of Gladbach’s side backs advanced with the ball down the flank the ball-near forward would be positioned quite wide, in addition to the ball-near central midfielder and the full-back. With this they aimed to create several passing options for the side backs to avoid them being easily isolated. Furthermore they aimed to use this presence in ball-near areas to combine quickly, this would theoretically allow them to shift the ball’s location before their opponents could gain sufficient access. Often they used 3rd man runs to release the wing-back down the wing. By passing into the ball-near striker’s feet they could attract the nearby opponents into the centre before releasing first time passes to the onrushing full-back. This was effective at times due to the eagerness of Bayer’s ball-near full-back to step forward and support the press. Of course when playing an opponent such as Leverkusen consistently building through the wings is difficult and there were a number of occasions where Leverkusen’s aggressive pressing allowed them to regain the ball in these areas. After the interval there were one or two minor adjustments that contributed to creating a slightly different dynamic in the 2nd half. This mainly stemmed from Leverkusen’s increased desperation to score and Gladbach’s increased caution after taking the lead. These adjustments were mainly linked to the key themes of the first half. With a greater need for territory and possession, Leverkusen began to press more consistently with a 3 or 4 man front line, depending on the ball far wingers’ movement. The staggering of the midfield 2 also seemed slightly different with both now acting on the same line and situationally marking Gladbach’s double 6. These movements were solely aimed at creating more access to force quicker regains and in turn have longer periods in possession to find an equaliser. Gladbach began pushing their wing backs further forwards in their early build-up which seemed to be a response to the issues the high positioning of Bayer’s wingers was causing. With the wing-backs higher in early build-up they could either force Kampl and Bellarabi to occupy deeper positions. This would reduce the speed at which Schmidt’s team could create access and allow them to pass time through circulating the ball across their back line. Alternately they could be easy passing outlets if Kampl and Bellarabi remained in advanced positions. Keen to prevent the home side from building up in stable fashion, Leverkusen continued to press in their 4-2-2-2/4-3-3 structures. At times this left a potentially dangerous underload at the back with the back 4 left exposed against Gladbach’s front 3 and wing-backs. This was largely well dealt with, and the time required for the ball to reach Gladbach’s forwards gave Aranguiz and Baumgartlinger time to drop back and support the defence. Gladbach secured victory late on in the game with a late goal from captain Lars Stindl. Both sides will be searching for better performances in the coming weeks as they at times showed signs of a pre-season game. These will surely come as the season progresses and how both sides juggle their Champions League and domestic campaigns will be interesting to follow. We use a programme called Inkscape.